This “Bank Reconciliation Procedure” may help those who is an accounts payable clerk to compare his or her internal cash records to those of the bank and reconcile any differences between the two. Have a look at the “Bank Reconciliation Form example” at the end of this post for better understanding. Go to the accounting computer system’s cash application module. Call up the account of the customer for whom a payment has been received. Log in the amount received, the date of the payment, and the identifying number of the check. Repeat the process until all cash has been applied for all the invoices paid by each customer. Use a journal entry to record cash receipts for items not related to invoices. During the month, enter manual checks into the computer system as soon as they are issued. Make a journal entry to record all expenditures associated with each payroll as soon as the payroll is generated. 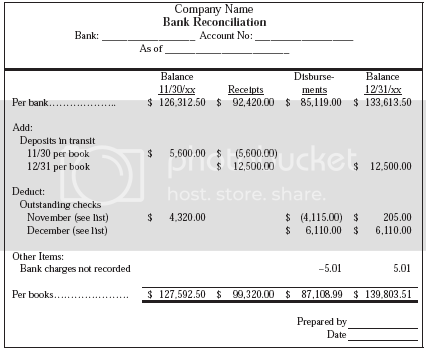 Make a separate journal entry for each wire transfer noted on the bank statement, unless these cash flows are already accounted for through the accounts payable or accounts receivable systems. Go to the accounting computer system and access the bank reconciliation module. Check off all issued checks listed in the bank reconciliation module that are listed as having cleared the bank on the bank statement. If any check amounts listed by the bank differ from the amounts listed in the module, make a journal entry to correct to the bank balance. Check off all deposits listed in the bank reconciliation module that are listed has having been received by the bank on the bank statement. If any deposit amounts listed by the bank differ from the amounts listed in the module, make a journal entry to correct to the bank balance. Make a separate journal entry for each special expense or revenue item on the bank statement, such as a monthly account processing fee. Record in the accounting system any manual checks not previously recorded, but which are listed on the bank statement as having cleared the bank. If all items reconcile and the bank statement still does not match, then the only remaining possible solution is that the beginning bank reconciliation was incorrect. When the reconciliation is complete, print the Bank Reconciliation and store it with the bank statement in a bank statement file for the current year, sorted by month.